p.s Thanks for all the get well wishes, they cheered me up a lot!! I cannot believe you did both at one time and got this fabulous clarity. Superb shot! I must confess I’ve a bit of a coffee habit so I don’t know I’m able to be impartial viewing this lovely image. The warm tones, gentle curves of the white espresso cup, and foamy froth almost leaves me smelling the aroma of fresh coffee. Catching those droplets in mid-flight is certainly the visual desert. Wonderful work, Martina! J’admire ton travail sur la lumière, la qualité de ton objectif et bien sûr la beauté de la composition. Encore une fois un très beau travail sur les fluides. Bravo, Martina ! And now I need to make a cup of coffe 😉 You have really made this look tasty! Wonderful concept and superb execution. Really mouth-watering result! Impressive multi-tasking, if I might say! The drip drops almost looks like hardened candy or sugar frozen in time like that. So glad you’re feeling better. A very well-chosen detail, presenting the droplets as small precious pieces of jewelry. I like the editing and the color very well. 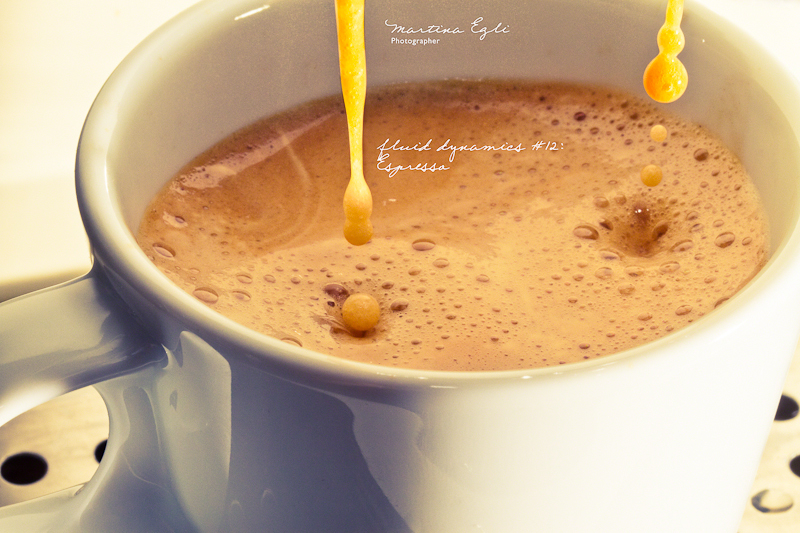 Lovely image Martina, love the droplets hitting the liquid! The richness speak volume here, great depiction! I like your mise en scène ! Soon I will post coffee too but this one is fantastic, the right moment, great shot ! ! ! I love love love this photo. I want an espresso right now!